.. with release of the American Community Survey 2014 (ACS 2014) 1-year estimates, it is now possible to compare the annual change in a range of demographic-economic measures for individual metropolitan areas — metros with 65,000 or more population. For example, the change in median household income, 2013-to-2014 ranged from -$8,966 (Houma-Thibodaux, LA MSA) to $9,789 (Marshall, TX MISA). The change in median housing value, 2013-to-2014 ranged from -$23,200 (Pinehurst-Southern Pines, NC MISA) to $79,700 (Santa Cruz-Watsonville, CA MSA). While these are estimates, and subject to estimation error, these data offer new insights into recent levels and short-term change characteristics. This section reviews data and tools available to analyze metro patterns and characteristics. See more detail in this related Web section. ACS 2013 and 2014 1-year estimates are included in the interactive table for population, median household income and median housing value. The 2014 median housing value-to-median household income is also included. Where do your metros of interest rank? See the interactive table (also reviewed below). The following graphic illustrates use of the ACS 2014 data to develop a thematic pattern map of median household income by metro (metros having 65,000 or more population). This graphic makes use of one subject matter item among hundreds of ACS subject matter items tabulated. Click graphic for larger view showing legend and mini profile example. — view developed using CV XE GIS software and related GIS project. — see details for information about the data used to develop the above view. — the following graphics illustrate use of the full interactive table. Individual metros are displayed by row. Attributes of metros are arrayed by column. Click column headers to sort/rank. The table is a scroll section showing all metros 65,000 population of more and is initially sorted on 2014 population in descending order. Use tools below the table to perform queries on the table. Set the population threshold to view only metros having population 100,000 to 500,000 (or any other range) and then click $MHI (median household income) 2014 column header to sort/rank this group on that column. Click a row; the row blue highlights. Optionally copy this row content to clipboard and paste in Excel or use with other software. Data Analytics can help most any organization more effectively reach goals and objectives. Whether a new or established business, serving a county or national market, similar tools and methods apply. The ACS data provide one important part of the data for Data Analytics. Subsequent posts will illustrate how to integrate ACS data with other data to gain important insights. .. to pick one geography among many important types of geographies, how has educational attainment changed by metro since 2010? .. median household income? .. median housing value? How do metros compare among peer group metros? Data required to answers these questions are only available from the Census Bureau American Community Survey (ACS). The American Community Survey 1-year estimates became available today, September 17, 2015. See details — ACS 2014 data access, integration and use. These demographic-economic estimates are released annually in September and are essential in many Data Analytics applications. The 1-year estimates are available for geographic areas having 65,000 population or more and reflect characteristics for the survey period January through December 2014. The following graphic illustrates use of the ACS 2014 data to develop a thematic pattern map of median household income by metro (515 metros that have 65,000 or more population). This graphic makes use of one subject matter item among hundreds of ACS subject matter items tabulated. Click graphic for larger view showing legend and mini profile example. • See more about the scope of subject matter tabulated. • See more about the scope of geographic tabulation areas. .. population projections to 2040 by age group: 25 year demographic outlook .. current demographic estimates are important as they tell us “where we are now” for a geographic area. Demographic projections tell us how the population size and composition might change in the future. 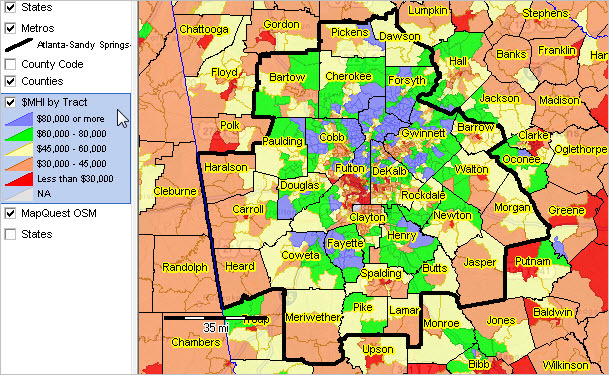 Current (2015) demographic estimates and projections to 2040 are described in this section for the Atlanta-Sandy Springs-Roswell, GA metropolitan statistical area (see about counties included). The 2015 population of 5,651,601 is projected to grow to 7,014,382 in 2040, an increase of 1,362,781 population (24.1 percent growth). These data provide a picture of the future and how the population size and composition might change. Knowing about how the population size and composition might change is important to most all private and public sector planning needs. These data can help stakeholders gain insights into the size of the workforce 25 years ahead and population distribution by age. The projections help business assess where and how the demand/sales of their products and services might change. The projections provide a basis to set goals and targets for the future. See more about development of these projections in the related Web section. — view developed with CV XE GIS software. 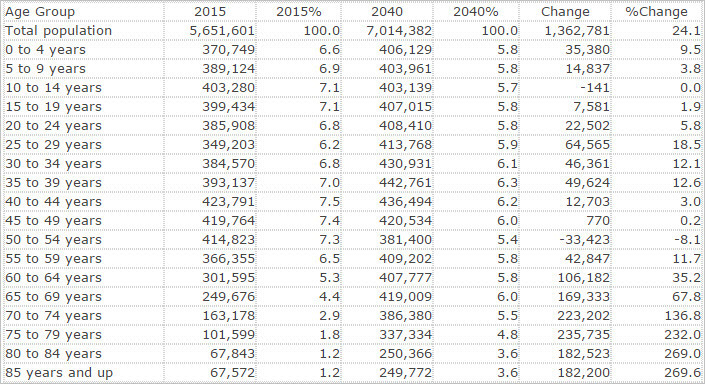 The following table shows 2015 population estimates and projections to 2040 by 5-year age group for the metro. These projections are based on more detailed demographic-economic projections developed by ProximityOne. Click graphic for larger view. The following table shows historical Census Bureau-sourced population estimates and components of change for the metro. Census Bureau estimates are updated annually and lag one year behind the current year. 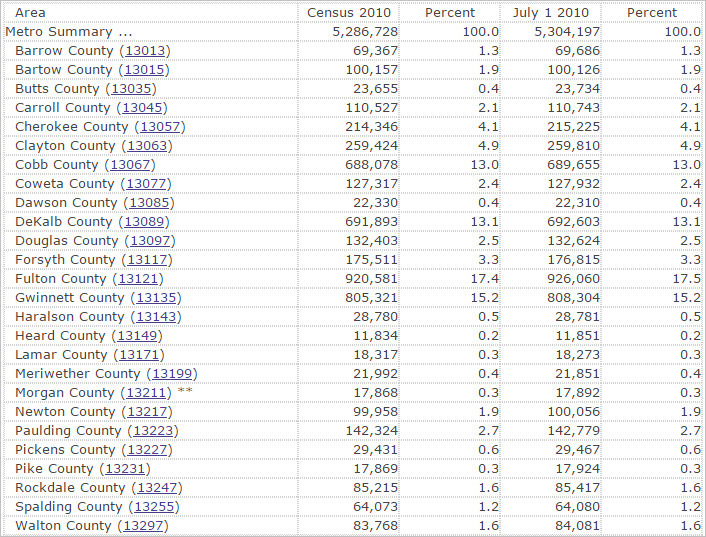 The Census Bureau does not develop state, metro or county projections. Click graphic for larger view. Metropolitan areas are defined as one or more contiguous counties based on a set of demographic-economic criteria. 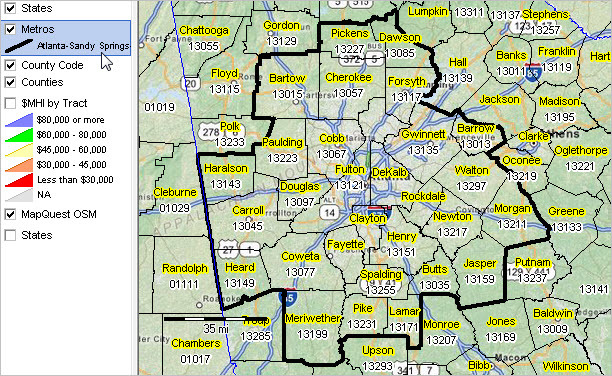 Counties comprising the Atlanta metro are shown below. In the related Web table click county code link to view county components of change and estimates by age/race-origin, 2010-2014. Click graphic for larger view. “Demographic Outlook 2015-2040” sections will be presented for other metros in the near future.